Is Sustainable Development Along the Mekong Possible? Political realities — starting with China — make Mekong management difficult. The latest Greater Mekong Forum on Water, Food and Energy took place from October 25-27 in Yangon, Myanmar. This forum is the biggest annual affair aiming to raise awareness and share research-based knowledge about sustainable development in the Greater Mekong region among NGOs, policymakers, private entities, and development agencies. The themes of discussion included water governance, monitoring and managing healthy rivers, river food systems, healthy landscapes and ecosystems, and natural resources management/ conflict-prevention. Noticeably, however, the Forum is oriented toward dialogue, listening, and deliberation; no concrete, binding conclusions or recommendations regarding management of the Mekong River were expected as a result of the Forum. This situation demonstrates once again the impossibility of “hard” talk when it comes to the equal and responsible distribution of benefits from the Mekong River. Sustainable development of the Mekong basin is too important to be persistently ignored. Approximately 284 million people, including around 400 ethno-linguistic groupings, live on the Mekong River. A majority of Mekong communities are considered “primary producers,” as they rely on the river’s ecosystems for their survival through foresting, farming, and fishing. Around two thirds of the basin’s population (40 million rural people) live on the “wild capture fisheries,” making the Mekong basin the world’s largest inland fishery. The Mekong River also fills irrigation systems for agricultural production. Thailand, for example, became the world’s largest rice exporter in 2015 thanks to 118 irrigation reservoirs along the Mekong River Basin. The river and its tributaries also play a vital role in transportation as they connect the mainland with the ocean. For example, Vietnam is not only the world’s third largest rice exporter thanks to the Mekong’s water supply, but the country also relies on the rivers for around 73 percent of cargo transport and about 27 percent of passenger travel by water annually. Regionally and internationally, the Mekong basin is important for preserving biodiversity. The Mekong region also possesses the greatest number of ecoregions (16 out of 200) in mainland Asia. There are 20,000 plant species, 430 mammals, 1,200 birds, 800 reptiles and amphibians, and around 850 fish species in the Greater Mekong subregion. The river’s waters also feed 54 million hectares of forest in the lower Mekong basin. With the river of such importance, the Greater Mekong Forum is not the only initiative of its kind in the Mekong basin. Others include the Greater Mekong Subregion, the Mekong River Commission (MRC), the American-led Lower Mekong Initiative, and the China-led Lancang Mekong Cooperation Mechanism. Uunfortunately, none of these initiatives has managed to deter unregulated resource exploitation along the Mekong. Even the MRC – the seemingly most powerful mechanism, established in 1995 based on the Mekong Agreement – is commonly seen as having no teeth as its authority is limited to non-binding consultation and facilitation. The daunting question is why it is so difficult to enforce an effective binding mechanism to monitor sustainable development along the Mekong. In answering this question, three aspects need to be considered. First of all, are member countries willing to give up their national interests and sovereignty in the name of cooperation? This is largely a rhetorical question at the moment, as the lack of political will to strengthen the Mekong Agreement is well-known. Particularly at this point, all four member-states are prioritizing economic development and industrialization. Thus, expecting them to surrender their sovereign right to build hydropower plants is ultimately out of question. The opportunity cost is especially huge for Laos. 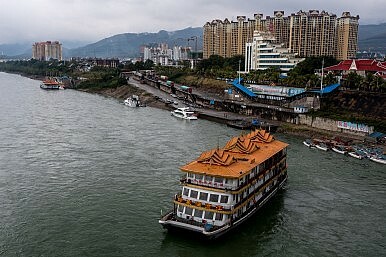 as the country is landlocked and can only depend on the river and its tributaries to push economic development and earn foreign investment (mostly from China). In fact, whether or not to fortify the Mekong Agreement resembles the classic prisoners’ dilemma. If countries are willing to cooperate, their benefits will be maximized, as sustainable development of the Mekong region will be guaranteed in the long run. However, because each member country is rationally self-interested and hesitant to give away their sovereign power, they have been stuck in the worst scenario, with exploitation of the Mekong’s resources out of control. Another important aspect is the fact that the negative impacts of uncontrolled exploitation of the Mekong are not felt evenly among the member countries. In the short run, downstream countries suffer the most. In the case of the Mekong region, Vietnam appears to be the most vulnerable as the Mekong Delta (the “Nine Dragon River delta” in Vietnamese), where the Mekong river exits into the sea through a complex network of distributaries, is the largest rice-producing region in Vietnam and covers 12 southwestern provinces of the country. In addition to threats of floods and salinization from rising sea levels due to climate change, the Mekong Delta is also susceptible to seasonal droughts, which are aggravated by Chinese upstream dams and El Nino effects. In the summer 2016, Vietnam experienced its worst drought and salinization in almost 100 years. According to one deputy head of Vietnam’s Ministry of Agriculture, the water level dropped to the lowest level since 1926. China, being the upstream country with large-scale dams, was held accountable for her water monopoly. The record-setting drought cost Vietnam $669 million from agricultural losses in addition to severe impacts on half a million households due to a lack of drinking water, food shortages, and forced internal migration to urban areas. The difference in the number of Water, Land, and Ecosystems (WLE) Greater Mekong partners reflects the varying levels of commitment: there are six from China, four from Cambodia, five from Lao, and eight from Thailand versus 22 from Vietnam. Given the country’s vulnerability, Vietnam is undoubtedly in a rush to push for a binding Mekong Agreement. Yet, Hanoi cannot do so without the support of the other three Southeast Asian countries, as well as China. So far, Vietnam’s efforts to change the status-quo have proved futile. The final obstacle to increased cooperation is the role of the Mekong’s water hegemon, China. In reality, interstate cooperation over water politics is not always so hopeless. The Nile Basin Initiative provides a quite successful example of negotiation on management of the Nile River. Egypt used to be the water hegemon in the region before being blocked by the determined cooperation of upstream states (Uganda, Rwanda, Tanzania, and especially Ethiopia) in 2010. Why did anti-hegemon cooperation work in the Nile Basin Initiative but not in the Mekong Agreement? A clear distinction needs to be made: in the former case, none of the 11 countries along the Nile River is disproportionately larger or more powerful than other countries. Meanwhile, the Mekong basin suffers from the politics of serious asymmetry as China significantly outweighs even the combination of Thailand, Laos, Cambodia, and Vietnam. Furthermore, China is an upstream state (while Egypt is a downstream state) and has lavish financial resources to pressure smaller countries. Consequently, China has become the most powerful veto-player in the Mekong’s water politics. Cambodia, Laos, Thailand, and Vietnam cannot effectively implement any set of binding water useage regulations as China has refused to participate in the long-standing Mekong River Commission. On the other hand, China attempted to force the small downstream countries to join the China-driven Lancang-Mekong Cooperation Mechanism, which would ultimately legitimize China’s water monopoly on the river. The Nile Basin Initiative suggests that in the presence of irreconcilable national interests and an uneven distribution of negative impacts between upstream and downstream countries, multilateral cooperation in river management is possible if and only if there is no dominant veto-player like China. By vetoing cooperation on the Mekong, China is giving up a golden opportunity to prove to the world its leadership potential. It is surprising how China is making great efforts to replace the United States in leading the charge against climate change and yet blatantly ignores the call for cooperation in the Mekong basin. Linh Tong is an editor for the East Asia region at Eurasia Diary and a coordinator at the International Eurasia Press Fund. The 63rd iteration of the Mekong joint patrols took place last week.